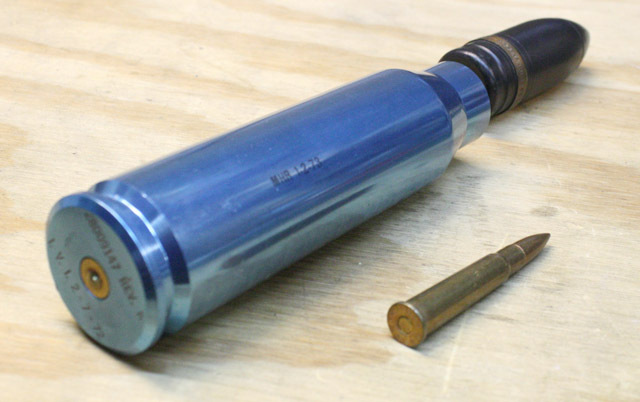 Looking through the OBG ammunition collection and found a 30mm blue anodized aluminum practice shell casing from a 30 mm gatling gun. Quite a work of art, and quite deadly too, although not this one, as it had only an inert aluminum payload in it's day. This shell fits the GAU-8A gatling gun, used on the A-10 Warthog in the last Iraq War. Developed in tandem with the A-10, the gun takes up a lot of space in the aircraft, comprising about 16% of the aircraft's weight. The 30mm gun itself weighs 600 pounds, but with ammo and feed system takes it to 4000 pounds fully loaded with 1150 rounds. Muzzle velocity is a screaming 3200 ft. per sec. The aluminum case for the round was important to save weight, lending more room for more ammo. The rate of fire is 3900 rounds per minute, but are usually fired in short bursts to help barrel life, which is only 20,000 rounds. Giving it all she's got will considerably reduce barrel life. The barrels are similar to the original gatling gun, where each barrel has it's own bolt, but the gun is operated using the plane's hydraulics. The gun also uses a linkless feed system which ejects the empties into a drum and carried home which accomplishes two things, simpler ejection since the empties aren't thrown out of the aircraft at high speed to keep from damaging the airframe, and keeping the weight to maintain center of gravity. The meanest round this gun shoots is the Armor-Piercing Incendiary (API) round which has the kinetic energy to defeat armor. using a high-density penetrator with fragmentation and pyrophoric effects. This pretty much means all hell is going to break loose inside the tank it hits.